The iconic fall of the Berlin Wall 25 years ago today shocked international leaders from Washington to Moscow, London to Warsaw, as East German crowds took advantage of Communist Party fumbles to break down the Cold War’s most symbolic barrier, according to formerly secret documents from Soviet, German, U.S., Czechoslovak and Hungarian files posted today by the National Security Archive at George Washington University. The historic events of the night of November 9, 1989 came about from accident and contingency, rather than conspiracy or strategy, according to the documents. 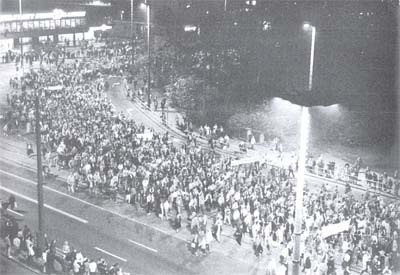 Crowds of East Berliners, already conditioned by months of refugee flights to the West and weeks of peaceful mass protests in cities like Leipzig, seized on media reports of immediate changes in travel restrictions — based on a bumbled briefing by a Politburo member, Gunter Schabowski — and inundated the Wall’s checkpoints demanding passage. Television coverage of the first crossing that yielded to the self-fulfilling media prophecy then created a multiplier effect and more crowds came, ultimately to dance on the Wall. 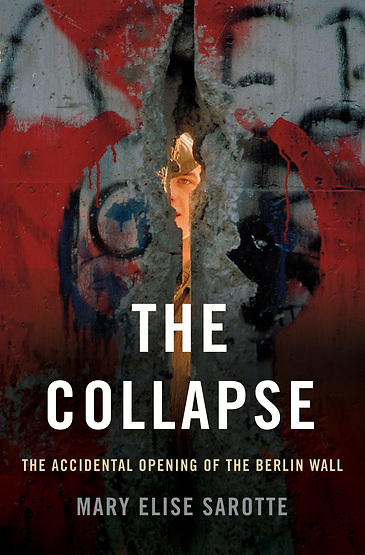 The documents show that the actual collapse of the Wall began with Hungarian Communist reformers who proposed in early 1989 to open their borders to the West, while seeking particularly West German foreign investment to solve Hungary’s economic crisis. Hungarian Communist leaders checked in with Soviet general secretary Mikhail Gorbachev in March 1989, letting him know they planned to take down the barbed wire; and Gorbachev — true to his “common European home” rhetoric — responded only that “we have a strict regime on our borders, but we are also becoming more open.” (Document 1) The Hungarian decision sparked a stream and then a flood of East German refugees. Gorbachev himself unintentionally gave a signal that the Wall could fall in his press conference on June 15, 1989 after a successful visit to West Germany, where in response to a question about the Wall, he said that “nothing [was] permanent under the Moon” and connected German rapprochement to the building of the common European home. In fact, his conversations with Kohl and other members of the West German government created a real breakthrough in Soviet-FRG relations, which would stand Kohl in good stead in the difficult reunification talks during the next year (Document 2). Gorbachev especially reinforced the theme of European unity in his speech to the European Parliament in Strasbourg where he presented his vision of the common European home on July 7, 1989. After speaking about an essentially united Europe based on universal human values, it would be hard to argue in favor of its continued division. By August 1989, the Hungarian-initiated refugee crisis had become so acute that the West German embassy in Budapest had to shut down, unable to handle the hundreds of East Germans camped out there for visas. On August 19, Hungarian reformers even hosted a “Pan-European picnic” near the Austrian border, after which some 300 East Germans high-tailed across the former Iron Curtain. The subsequent negotiations on August 25, 1989 between Hungarian Communist leaders with West German chancellor Helmut Kohl and foreign minister Hans-Dietrich Genscher show the Hungarian calculation that only the deutschmark could save them, and by mid-September the Hungarians lifted all East-West controls (Document 3). Other world leaders were not at all eager for the Wall to fall, notably the British prime minister, Margaret Thatcher, who told Gorbachev on September 23 to ignore those NATO communiqués about German unification, that even her buddy, U.S. president George H. W. Bush opposed that kind of change (she would be wrong, when the time came. See document 4). As Gorbachev later commented to his Politburo on November 3, the West did not want German unification, but it wanted to prevent it “with our hands, to push us against the FRG” so as to head off any future Soviet-German cooperation — but Gorbachev believed European integration was the ultimate solution to Soviet economic problems (Document 6). Czechoslovakia was closer to East Germany than Hungary was, and after Hungary opened its gates, Prague quickly filled with East Germans willing to dump their Trabant cars in the streets for a chance to clamber over an embassy wall and flee to the West. By November 8, Prague had become so choked with East Germans that the hard-line Czechoslovak Communist Party’s Central Committee made a demarche to East Berlin demanding they open their borders — a moment of pressure from fellow Communists that played a key role in the East German party’s decision to announce revised travel regulations the next day (Document 7). The draft regulations were full of temporizing language and largely intended to let off steam while kicking the emigrant problem down the road. East Germans would have to apply for visas, and the vast majority who lacked passports would have to wait even longer for those. But the presentation of the new regulations came at the very end of a botched press conference from 6 to 7 p.m. Berlin time on November 9 by SED Politburo member Gunter Schabowski, who did not know the back story, the hedges, the limitations meant by the drafters of the documents. Visibly rattled from the shouted questions about travel and the Wall, Schabowski read from his briefing papers the words “immediately, without delay” when asked about the timing of the changes that would allow any East German to emigrate (Document 9). Television news and the wire services as well promptly announced the opening of the borders, and in a kind of self-fulfilling prophecy reinforced by TV coverage, crowds of East Germans massed at the border crossings and ultimately persuaded the senior official at the largest inner-city checkpoint at Bornholmer Strasse to open the gates (a story told in fresh detail by Mary Elise Sarotte in her new book, The Collapse: The Accidental Opening of the Berlin Wall). Once Bornholmer opened, other crossings soon followed; and within hours, people were chipping off souvenir fragments from the concrete panels formerly surrounded by a “death strip” in which earlier Wall jumpers had died. So unexpected was the Wall opening that Helmut Kohl himself was not even in the country. Instead, the West German chancellor had gone to Warsaw to meet the new Solidarity leaders of that country, and work out some long-standing Polish-German tensions. The transcript of Kohl’s discussions with Lech Walesa show the Polish leader complaining that events in East Germany were simply moving too fast, and even predicting, presciently, that the Wall would fall in a week or two — at which point Kohl would have no time (or money) for poor Poland (Document 8). But at Gorbachev’s side, his foreign policy adviser Anatoly Chernyaev in private let loose with one of the very few high-level expressions of real joy about the fall of the Berlin Wall. Chernyaev’s diary entry for November 10, 1989 (Document 12) contains the coda for the demise of the Iron Curtain, “the end of Yalta” and the Stalinist system, and a good thing, about time, in Chernyaev’s remarkable view. Document 1: Record of Conversation between Mikhail Gorbachev and Miklos Nemeth, Moscow, March 3, 1989. Document 2: Mikhail Gorbachev Press Conference Excerpts, Bonn, June 15, 1989. Document 3: Hungarian discussions (Nemeth/Horn) with West German leaders Kohl and Genscher, Bonn, August 25, 1989. Document 4: Conversation between Mikhail Gorbachev and Margaret Thatcher, Moscow, September 23, 1989. Document 5: Anatoly Chernyaev diary excerpt, October 5, 1989. Document 6: Notes from the Soviet Politburo Session, November 3, 1989. Document 7: Demarche from the Czechoslovak Communist Party to the GDR SED, November 8, 1989 (original German language version). Document 8: Record of Conversation between Helmut Kohl and Lech Walesa, Warsaw, November 9, 1989. Document 9: Documents from the East German Communist Party (SED) and the transcript of the Gunter Schabowski press conference, November 9, 1989. Document 10: President Bush Remarks to Reporters, Washington D.C., November 9, 1989. Document 11: Record of Telephone Conversation between Mikhail Gorbachev and Helmut Kohl, November 11, 1989. Document 12: Anatoly Chernyaev diary excerpt, November 10, 1989. Document 9 is courtesy of the German scholar Hans-Hermann Hertle, who was the first to reconstruct in detail the Schabowski press conference debacle, including his own transcription of the Schabowski video and publication of the backstory documents of drafts and SED decision making on travel regulations, in his seminal article, “The Fall of the Wall: The Unintended Dissolution of East Germany’s Ruling Regime,” in the Cold War International History Project Bulletin No. 12/13, Fall/Winter 2001, pp. 131-164.